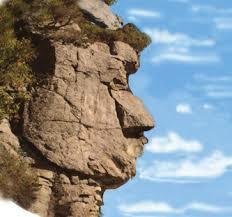 Charleston Lake has had a guardian watching over it’s waters for eons, it’s features carved by time and the elements. 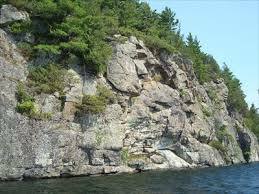 Always vigilant, Old Baldy is a granite rock formation that overlooks the blue waters of Charleston Lake and is the face of approximately 130 acres of mixed forest and wetlands. This undeveloped portion of shoreline is a wonderful example of the diversity of plant and animal life the Frontenac Arch Biosphere is known for. Species at risk, including Peregrine Falcon, Gray Ratsnake, and American Butternut, are just a few of the unique species that call this area home. 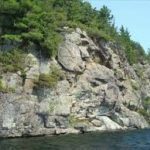 Hundred foot sheer cliff faces meet the lake waters, topped with White Pine and Hemlock and hardwoods such as Red Oak, Sugar Maple, and Shagbark Hickory. This idyllic landscape seemed destined for development in 2010 when preapproval was given to build cottage lots above and behind Old Baldy. A call to action by two Charleston Lake families and a partnership with the Nature Conservancy of Canada and the Thousand Islands Watershed Land Trust generated a fundraising campaign to purchase the land and keep it from being developed. The community rallied, the land was purchased and the future of Old Baldy was secured. Now the Nature Conservancy of Canada owns the land, but the best way to view the site is by water. They are currently developing a plan how to best open a land route to the site but for now, they ask the public to use caution. The goal is to keep the area free of fences and as natural as it has always been and it’s silent sentinel can continue his vigil as the guardian spirit of the lake. Paddling: It is suggested that you purchase a good map of Charleston Lake and bring a compass and GPS. The lake is large and there are more than 100 islands and 100 miles of coastline. The Cataraqui Region Conservation Authority maintains a boat ramp in Charleston village (map) on Water St. Put your boat in the water and paddle southeast to the site. 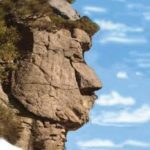 As you come around the bend, the towering face will be on your left.